Last fall I bought a shiny new car. 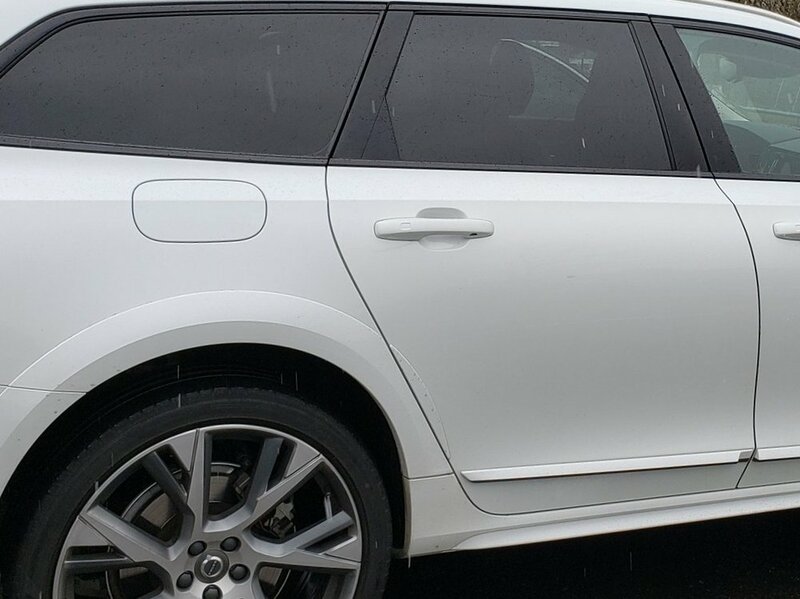 It is a pearl white fully loaded Volvo V90 Cross Country. The car is an amazing mix of practicality, technology, performance and good looks. I have always been very particular about my cars taking pride in keeping them clean and in good condition. I am very particular about where I park and make every effort to protect my car from door dings and other blemishes. I looked at the door and saw a nice size dent and the paint chipped away from the pearl white paint of my brand new car. My frustration was muted by my compassion for Matt having owned up to what happened and his honesty in leaving the note. I called Matt and thanked him for the note and for his honesty. I explained that in this day in age it is rare to have someone admit to such a mistake and that I truly appreciated that. I did explain that the car was less than one week old. He was adamant that he take care of the repairs. I told him I would work to find the most affordable solution. I went to two bodies shops as well as the Volvo dealer. All gave me outrageous quotes of $1,200-$3,000 to make the repair. I finally found a dent repair person who pulled the dent for $160. The dealer provided me with some free touch up paint. The door is smooth and sealed now, but the paint blemish is very clear. The only way to fully fix it would be to repaint the full side of the car. Instead, I have chosen to live with it. After all it is on the passenger side so I don’t see it often and when I do it reminds me to have faith in the goodness of people like Matt who are honest. After several email exchanges to finally meet, Matt and I finally got together and he paid me the $160. He was very apologetic and seemed like a really good guy. I felt guilty taking him money, but he understood that I had done what I could to minimize the cost. Matt is clearly a hard working honest guy who works at a brewery doing what he loves. I commend him for his honest and integrity. In addition to this blog post I have written to his manager to let him know he is fortunate to have someone like Matt on the team. Doing the right thing is a rarity and I hope that Matt gets rewarded for his actions as he is one of the good guys who is driven by a moral compass. When it comes to choosing between local breweries for meetings or events I will choose Catawba because of Matt and the way he conducts himself and represents is employer.